Jewish Rituals :: "The Sabbath Queen"
Shekhinah (שכינה) is the English spelling of a grammatically feminine Hebrew language word that is used to denote the dwelling or settling presence of G-d. She is a beautiful being of light, whose most important function is to intercede with G-d on behalf of her children. Shekhinah also represents compassion in its purest form. 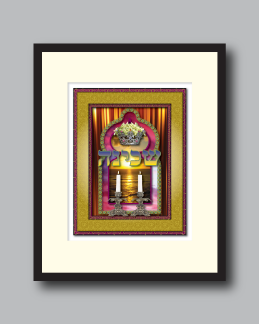 In more recent tradition, Shekhinah is revered as the "Shabbat Hamalka" or "Sabbath Queen and Bride". The background of this art piece depicts a golden curtain with a large Moroccan-style open window, creating a "dwelling" or sanctuary for the presence of the "Shekhinah" to enter. 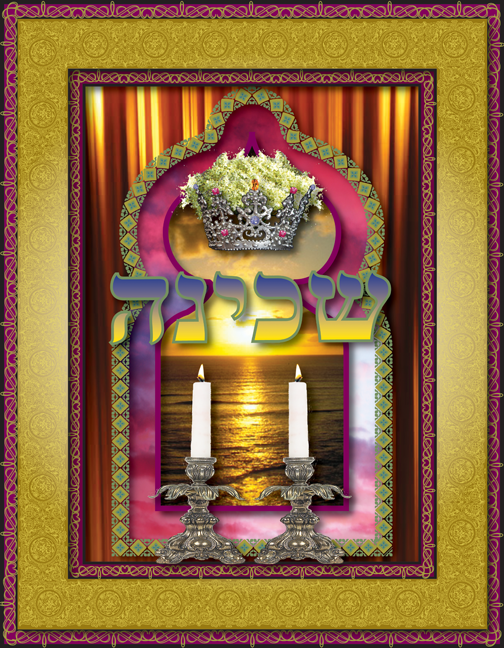 As the sun sets outside the window, the Shabbat candles beckon and invite this divine presence to dwell within. 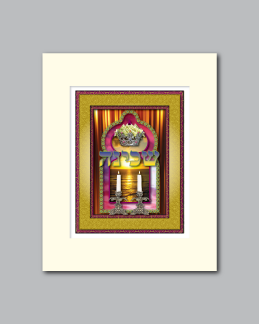 In the foreground, the Hebrew word Shekhinah is illustrated with the colors of the setting sun. A bejeweled crown, symbolic of the female aspect of our Creator floats above. Overflowing from her majestic crown are elderflowers, the floral symbol of compassion. As you gaze upon this artistic composition, invite the spirit of the divine into your own life.